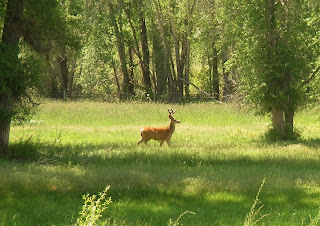 Yesterday we left Blue Mesa and gently wound our way up Hwy 50 next to Tomichi Creek, where we spotted this buck. The day's ride was much more enjoyable than the previous day as we climbed only 1000 ft. in 51 miles to Sargents, and we had a fantastic tail wind the whole way! 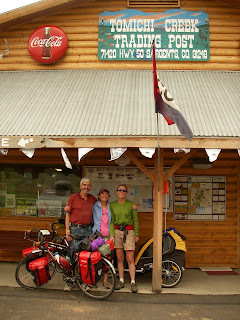 To top off the day, as we approached Tomichi Creek Trading Post in Sargents we were greeted by two of our closest friends, Ray and Brenda. We had a most joyous reunion! We are taking a rest day in Sargents, at the foot of the serious climbing to the summit of Monarch Pass and the Coninental Divide. Ray and Brenda are going to take our gear and Jack in their car allowing us to climb unburdened, what joy! They will continue to sag our gear the next several days into Denver. On a sad note, we believe we have lost the companionship of our young friend John. Yesterday he decided to continue over the pass to camp on the other side. We have no cell phone service here so we have lost contact for now. Time presses for John so we think he will push on to Pueblo and beyond. He has been our companion since Fallon, Nevada and he will be missed. John is a creative, intelligent young man with a sunny disposition. John, good luck and best wishes, keep in touch through the blogosphere, and perhaps we can get together again on the East Coast. Good to meet you and your traveling companions on Monarch pass! I made it back to Gunnison... I am traing for the Leadville 100 mt bike race so hopefully that goes well and your trip does too! Jarral, it was nice to meet you also. Our friend Ray was surprised to meet some one who knew his cousin. What a small world! Have a great race in the Leadville 100.